Odissi dance school, SRJAN, a premier training institution was founded by Guru Kelucharan Mohapatra at Bhubaneswar, Odisha in 1993. Now run by his son & disciple, Guru Ratikant Mohapatra, Srjan is committed to preserving and popularizing the rich culture of Odissi by maintaining high standards of performance & professionalism. Regular dance classes for local students & special classes for foreigners are augmented by summer workshops, performances, new choreographies & dance and music festivals. Rajashri Praharaj is an accomplished artiste of the Guru Kelucharan Mohapatra gharana of Odissi. Her formal training in Srjan (Odissi Nrityabasa) as a resident student under the able tutelage of her Guru Shri Ratikant Mohapatra, helped her to master the art and technique of Odissi dance. Aishwariya Singhdev, coming from a business family background has proved herself as a befitting addition to the Srjan Repertory. She has got the inspiration and support for Dance from her parents. Her talent has been recognized since her childhood and she started performing since then. She has been learning Odissi Dance from “SRJAN” since the last decade and is one of the most coveted members of the Srjan repertory. Sipra Swain is a young hardworking member of the Srjan Repertory. Nurturing her bent in dance under the able tutelage of Guru Ratikant Mohapatra in Srjan, Sipra is set to achieve greater heights as a performing artist. She has completed her Nrutya Shastri Purna in Odissi dance from Odisha Sangeet Natak Academy. Pragnya Parimita Das is one of the young talents in Srjan repertory. She belongs to a cultural background aiming to become a professor in dance appreciation on successful completion of her doctoral degree. Currently she is in her first year of Master’s in Utkal University of Culture. Ritu Sengupta is one of the senior disciples of “Srjan” and has her initial training under Smt. Pompi Paul. Latter she received the benefit of professional training under the guidance of the well-known GuruRatikantMohapatra in Odissi Dance. Riyanka Chakrabarty, born in an educationally inclined family is determined to become a professor in dance appreciation and improvisation after completing Ph.D degree in Odissi Dance. Currently she is pursuing a post graduate degree in music at the Utkal University of Culture after completing her schooling in J.B.R. Govt. Girls High School at Nimapada and junior college in UtkalSangeetMahavidyalaya in Bhubaneswar. 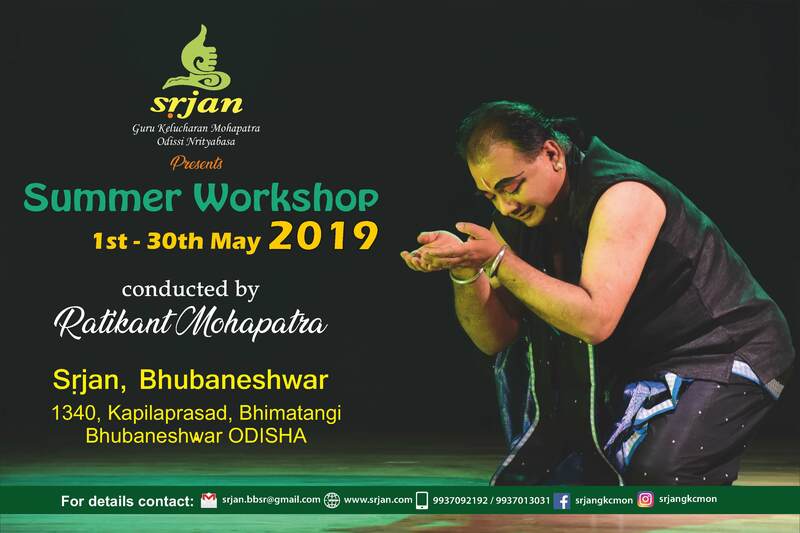 Sanjay Kumar Behera undergoing training under Guru RatikantMohapatra in Srjan is one of the most promising disciples of the KelucharanMohapatraGharana in Odissi. He is the topper and cash awardee of Naveen Kalakar, a state level competition in Odissi which confers the title “OdissiJyoti”. Reebdhita Barua was initiated into Odissi dance under Smt. Kakoli Bose when she was four years old in the year 2004. In 2007, she started training under Guru Sri Ratikant Mohapatra at Srjan, Bhubaneswar. She received the cultural talent search scholarship scheme in 2013 from Centre for Cultural Resources and Training under the aegis of Ministry of Culture, Government of India. Maya is a disciple of Guru Ratikant Mohapatra and a member of the Srjan Repertory Group. She began her Odissi training under Guru Prativa Panda of Bhubaneswar. After she moved to Bangalore, she trained extensively for 7 years under Guru Sharmila Mukerjee. She has also trained briefly under Guru Daksha Mashruwala in Mumbai.